1943. North Africa is in the bag. The Germans, with their millions of tanks and their lethal 88mm artillery pieces, have been given a bloody nose. The people of Tunisia, Egypt and Libya can breath a sigh of relief, knowing that the evil Nazi menace has receded (or been blown to dust). So what next for the victorious Allies? South Africa? No, they're our chums. Gambia perhaps? They should be easy to beat. No, ifs got to be Italy, land of wine, fast cars and women with large behinds. The Allies fondly believed that if they bunged thousands of blokes into Sicily and Italy, Hitler would divert thousands of his blokes to defend it and make things easier for the English to land in France. A classic plan if ever there was one. 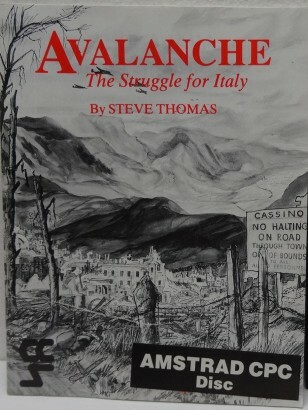 On the 9th of September, Operation Avalanche swung into, er, operation. The Germans, possibly having received pre-production copies of this game, were ready and waiting for them in just the right place. A fierce scrap started. As Commander of either the Germans or the Allies, you can move your troops around, call in airborne help and basically do what you hope the enemy isn't expecting. At the start, when you choose sides, you can also fiddle with the unshakeable facts of history. You can choose to have the Italians on either side (insert any Italian joke here), and can speed up or slow down the Allied reinforcements. 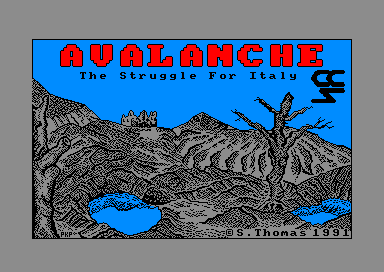 Then, as if by magic, a blocky map of Italy unfolds before your disbelieving eyes. From then on, you're in the thick of the battle. But don't expect the urgency of War to flood out of your screen into your living room, scaring the cat. Because things do not happen quickly. First ifs the German Air phase. If you're playing the Allies (which, for the sake of this review and political credibility in general, I'll assume), you must wait while the Teutonic terror makes two or three of your little unit characters flash. This, we are told, is the might of the Luftwaffe unleashed on the plucky, cowering Brits. If you've survived the withering air assault, the Germans then move. The map scrolls slowly from unit to unit, as they chug over the green and pleasant landscape of Southern Italy. Time passes. Then you get to drop bombs on the Germans from the air. You have three attempts. Following that, a few more phases happen, which involve a lot of SPACE bar pressing and not-very-interactive watching. Then you move. One by one, you select your units using the cursor keys. You move the cursor to where you ultimately want them to end up, and they promise to do their best. Some more time passes. Then war happens. When two or more opposing units meet, they take it in turns to flash. Sadly, no immediate details are available to tell you what damage has been done to who. if a unit gets too knackered, it withdraws, or disappears completely. As long as you're not stupid, beating either side on Beginner mode is just a matter of time. You have to be patient, and keep plugging away solidly. Any heroic stuff by individual units almost always results in complete death for your boys. 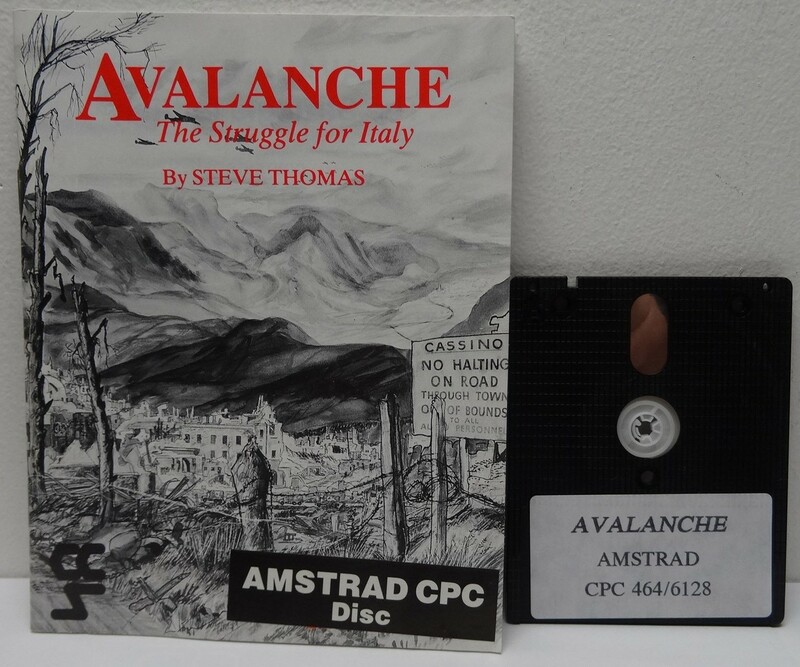 Avalanthe isn't as exciting as the real Italian campaign. There must be a lot of processing going on in the old Z80, but ifs certainly very slow. All keypresses are buffered, so if you hit a key a few times in frustration, you could end up by withdrawing completely, handing Britain to the Allies and digging a shallow trench in which to fall after they've shot you. The strategic element is well thought out, though. A lot of care has obviously gone into getting the scenario historically accurate. This technical aspect is the game's strongest point. And ifs mildly interesting to see if you, playing the Germans this time, can halt the flow of plucky Brits and turn the tide of the War back in favour of the manic teetotal vegetarian with the laughable moustache.